Megan McCray — founder and owner of McCray Accounting Services — is a certified QuickBooks Online Advisor. Her services include accounting and tax services, bookkeeping, budget setup, hiring assistance, business planning and consultation, payroll support, and more. For package inclusions and other pricing details, click here. 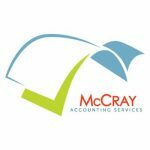 Work For McCray Accounting Services? Claim This Page.